No love for Stan Kroenke. 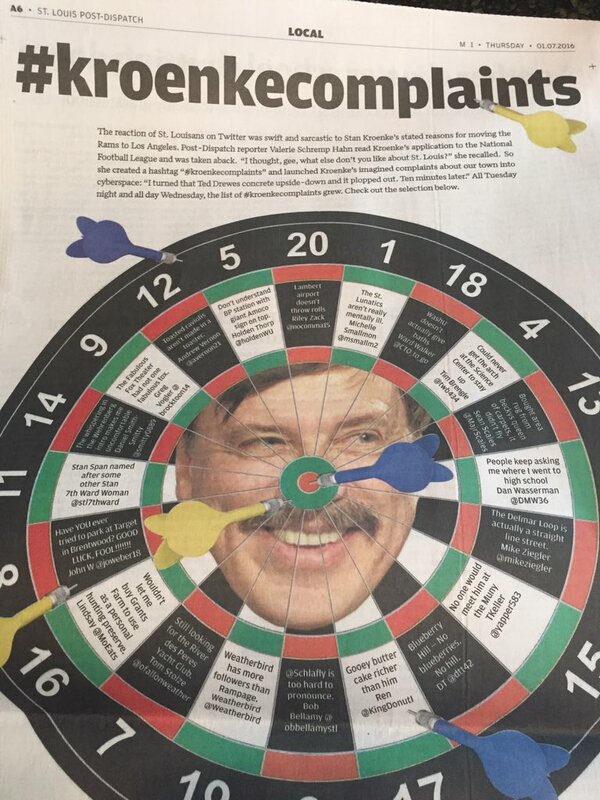 The St. Louis Post-Dispatch on Jan. 7, 2015, published this illustration after the release of Kroenke's reasons for wanting to move the NFL Rams from St. Louis to Los Angeles. A few years ago, long before he cast his desire to move the St. Louis Rams to Los Angeles in scorched-earth terms and united an entire city against him, I actually met Stan Kroenke. That alone is apparently unusual: The mayor of St. Louis doesn’t recall ever meeting Kroenke in his 15 years as the city’s leader, even when it became clear Kroenke was thinking about bolting with the Rams. Meeting Kroenke, for an interview, wasn’t easy. And he didn’t say much. He so rarely talked to the media that he had the nickname of Silent Stan. But in 2010, soon after he bought the Rams, I flew to Denver to see him – and perhaps that should’ve been the first clue of what was to come. He was not in St. Louis. He was staying at his penthouse condo inside an arena in downtown Denver, where his Nuggets and Avalanche played. We talked as he worked out in the gym. He answered questions while running on a treadmill. Back then, Kroenke buying the Rams was seen as a very good thing. After all, he was a Missourian through and through. He’d been raised in a tiny town in the middle of Missouri, a rural place where you pronounce the state as Missour-ah. He attended the University of Missouri-Columbia, where students know to call it Mizzou. Even as he accumulated his fortune, he kept a house in Columbia, Mo. He raised his family there. He understood what it meant to live in the middle of the country, far from the coasts (even far from Chicago), and to be a little insecure about that. That counted for something. To fans, it was reassuring. Kroenke was one of them. That’s why many were shocked to read the 29-page document he sent this week to other NFL team owners outlining his reasons for wanting to move the St. Louis Rams to a new stadium in Los Angeles. The document, obtained by The St. Louis Post-Dispatch, reads like a nasty divorce petition. Kroenke is not only repulsed by St. Louis, but he feels let down by St. Louis. The differences can’t be reconciled. There is no way this marriage can be saved. He never really was in love. He dings the city’s slow economic growth. He criticizes it for a shrinking population. A sucker punch from an outsider -- people in Missouri might’ve expected that. Missourians can be wary of outsiders, and that's especially true of St. Louis residents, a city that can seem like it’s just waiting for someone else to leave. In 1910, it was one of America’s biggest cities. Now, it ranks just behind Corpus Christi, Texas. So Kroenke is right, the city is shrinking. And St. Louis -- still a great, charming city -- has been burned before. It has seen Anheuser-Busch gutted by new Belgian-Brazilian owners. TWA, based in St. Louis, once offered hundreds of flights from there, even a direct to London. Then Texas-based American Airlines bought it. Today, Southwest is the biggest carrier at St. Louis’ airport. But with Kroenke, St. Louis is being betrayed by one of its own. That’s made this fight very personal. Some activists even suggested Kroenke wants to leave because of the ongoing Black Lives Matter protests centered in Ferguson, a town just outside St. Louis. This is not typical behavior for St. Louis. At baseball Cardinal games, fans are known to applaud fine plays by the opposing team. “Midwestern nice” is a real thing. I know this because I lived in St. Louis for a decade. And I understand why Kroenke’s letter has provoked such out-sized anger. It was not just a finger in the eye, but fingers jabbed in kidney, ear and that oddly sensitive spot on the back of your arm. Kroenke didn’t just beat up on St. Louis. He went after St. Louis’ deepest-rooted insecurities to do it. It’s like taunting someone over a speech impediment. Or teasing a weight-conscious woman about what she eats. Kroenke has a reputation as a businessman. His silence is seen as business acumen. He is a fan of business models. When I interviewed him, he talked lots about the sports business model. He was all about cost inputs and being financially responsible. But Kroenke’s proposal to other NFL owners closes on an emotional note. It’s a quote from a sports columnist describing the Rams as family. They are legacy. In this case, the columnist is talking about L.A. But he could’ve been talking about St. Louis. Because only families fight like this.